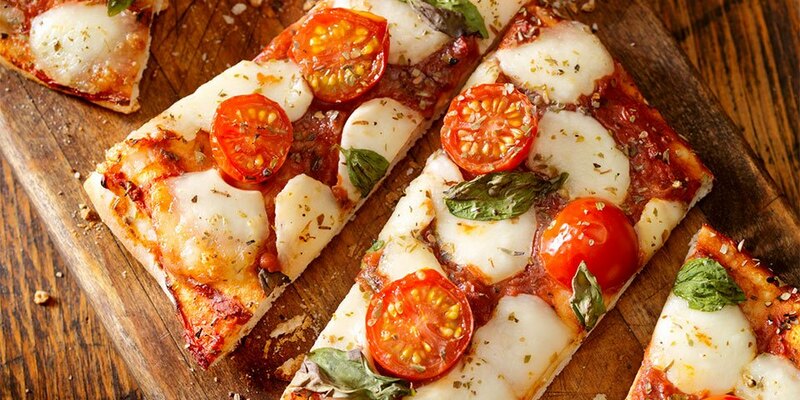 Flatbread pizza has been an on-trend menu item over the past few years. It’s even showing growth on menus (up 4.4% over three years according to Technomic’s MenuMonitor), which is especially notable considering many restaurant operators are scaling back on the number of items on their menus. One of the leading growth avenues for flatbreads outside of Italian/pizza restaurants is casual-dining sports bars and varied menu concepts, where customers often order these items to share as appetizers or light entrees. One-fifth of consumers think flatbread pizzas are typically higher in quality (20%) and taste better (19%) than traditional pizzas. 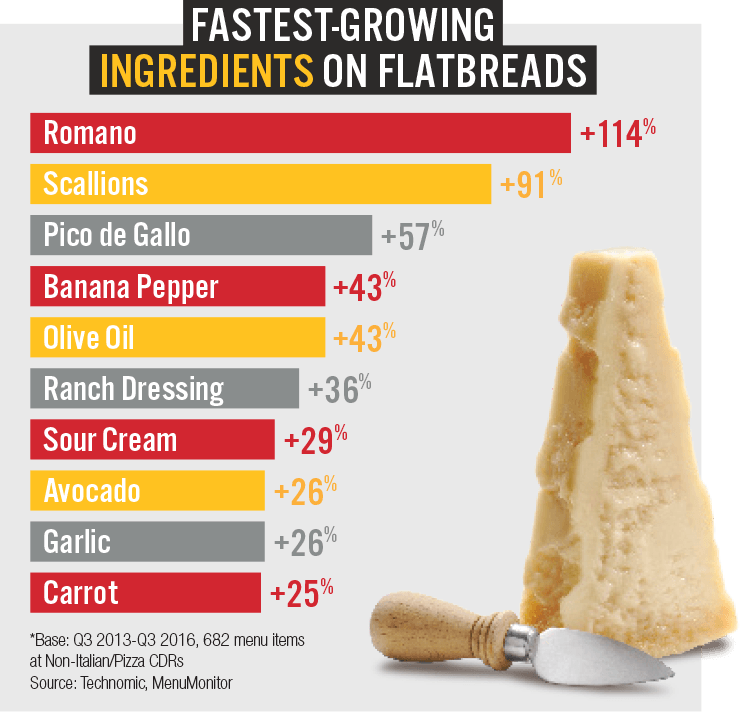 The list of fastest-growing ingredients on flatbreads at non-Italian/pizza casual-dining chains over three years shows that operators are trying to think out of the box when it comes to flatbreads. And since pizza and cheese generally go hand in hand, it’s no surprise that a number of dairy products are featured in the top 10. Romano cheese, which leads the list, is a firm Italian cheese that is relatively mild in the cow’s-milk version but sharper and tangier in the sheep’s- and goat’s-milk versions. Some operators are opting for grated Romano cheese in place of standard mozzarella on flatbreads to differentiate. Other dairy products in the top 10 include ranch dressing and sour cream, both of which are often used as a drizzle on flatbreads. Another trend extracted from the fastest-growing list is ethnic variations. Operators are using pico de gallo, sour cream and avocado for a Latin twist, while scallions and carrot are often the spotlight on Thai-inspired flatbreads. Flatbread pizzas are typically starters and entrees at lunch or dinner, but opportunities lie in other mealparts and dayparts. Flatbread desserts, such as Ruby Tuesday’s Apple Crumble Flatbread served with vanilla bean ice cream, are notable mashup options, and breakfast flatbreads topped with eggs and melted cheese are innovative morning offerings. Some operators are also promoting between-meal snacking, in which mini flatbreads or larger, shareable flatbreads are ideal for guests. Dips or drizzles can add flavor and texture to flatbreads, help differentiate and provide easy customization. And housemade sauces are worth the effort: consumers will associate flatbreads featuring sauces made in-house with chef-crafted, high-quality fare. More than any other age group, those aged between 18 and 34 years old are the most willing to order and would most like to see more flatbreads at restaurants. Focusing on the preferences of this consumer demographic—such as ethnic flavors and unique cheeses—is key when creating new flatbreads.